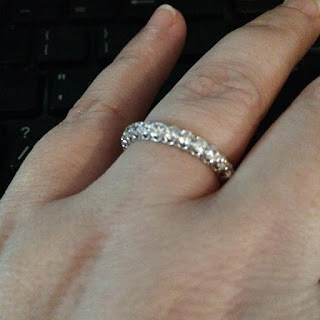 I was recently asked to review a piece of jewelry from the diamond engagement ring line at Anjolee. I was given several beautiful options to pick from including rings and earrings. I have to tell you it was a hard choice! I wanted them all! 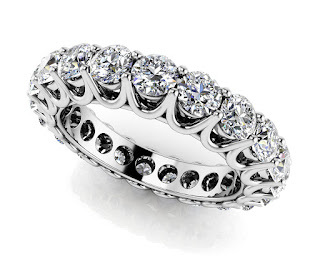 In the end I picked the Unique Shared Prong Diamond Eternity Ring. For the review purposes I received a CZ - which is absolutely gorgeous - however Anjolee makes real diamond jewelry. In fact most pieces are customizable with stones and clarity. You can truly get a one of a kind piece from Anjolee. The ring I chose has been a perfect option for me since I'm pregnant and can't always wear my normal setting. I love the brilliant shine and sophisticated style of this ring. The setting is solid and I know I will be enjoying this ring for many years to come. As you can see it looks fantastic on my hand! Anjolee has a huge selection of engagement and wedding sets as well as bracelets, earrings and necklaces.